Although I have long left Maine and now traversing the New Zealand countryside, I still wanted to share some of Maine with you. I promise to bring New Zealand to you here soon! During one of our last days in Maine, this Red-tailed Hawk decided to make a presence in one of the trees near the Osprey nest in our harbor. As one would expect, the Ospreys were not happy as they had two young fledglings in their nest nearby. 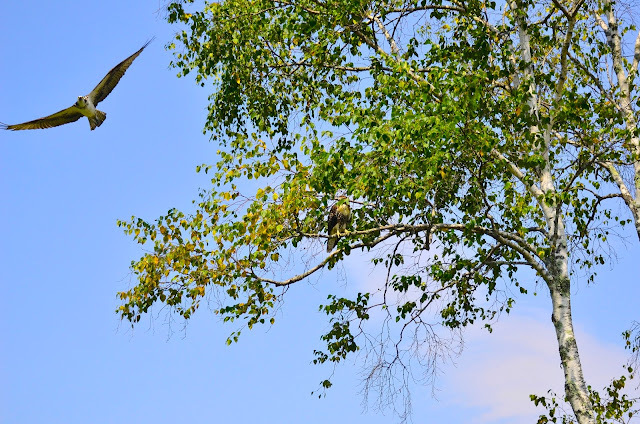 What captured my attention was the constant "cheep cheep cheep" had turned into a "cheereek cheereek cheereek" cry and upon looking out my window, I observed the Osprey diving towards our birch tree. Of course, I grabbed my camera and ran down near the tree and sat there for the next 30 minutes as the Osprey circled and dive bombed the Hawk, clipping leaves from the tree with each swoop. 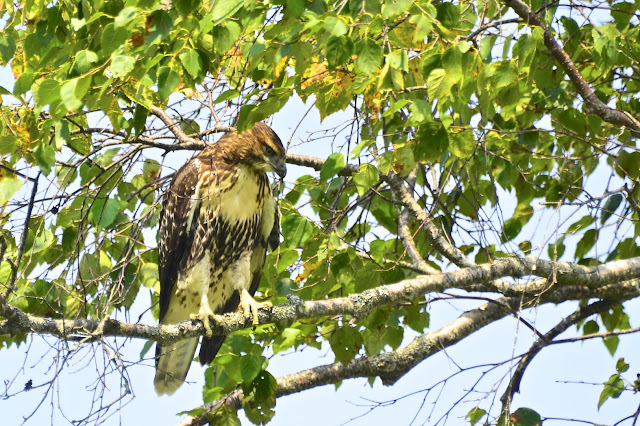 the Hawk simply ignored the Osprey and gave him no heed. continued scoping out the field below. I'm unsure if the Hawk was really interested in the Osprey's young. Seemed to me his attention was more on the field below, perhaps seeking mice. 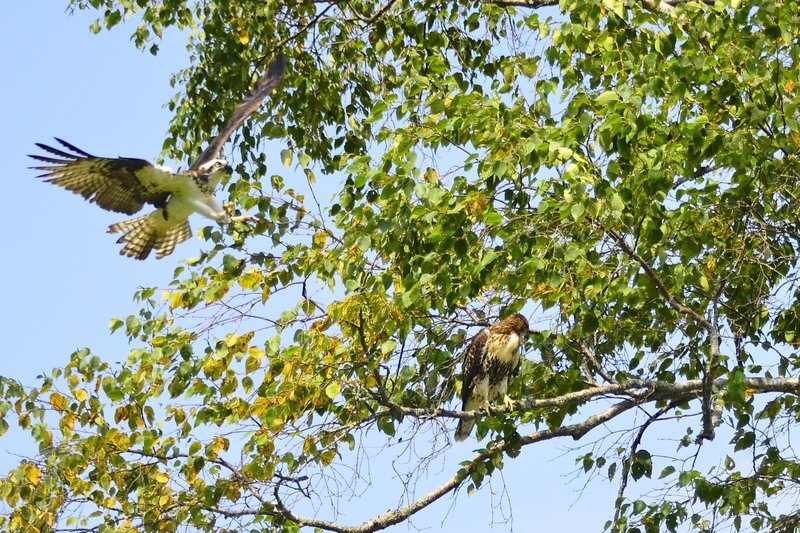 But no matter, the Osprey was quite unhappy with the Hawk in his territory. They both totally ignored me which was surprising. I thought my presence would scare at least the Hawk away. He only gave me the evil eye now and then. 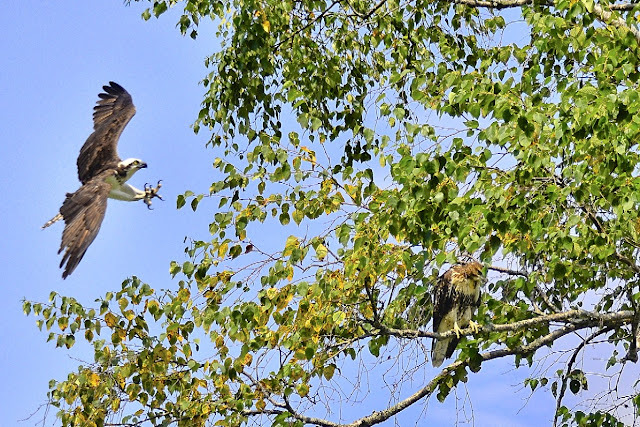 Eventually, the Osprey returned to its nest and shortly thereafter, the Hawk flew away. We were treated to this scenario one more time that evening as we enjoyed a glass of wine on our neighbor's deck. But this time, the tree was much closer to the Osprey's nest. Perhaps the Hawk was interested in those little ones after all. great story and pictures. Of course nature is not like Disney would lead you to believe. Maybe the hawk had a few little ones to feed at home? Fantastic shots of these two beautiful birds. Great shots. Love the hawks. Awesome captures, Reena! Such beautiful birds! Hope you're enjoying New Zealand! I'm looking forward to your pics!! What an intriguing event to watch and photograph. 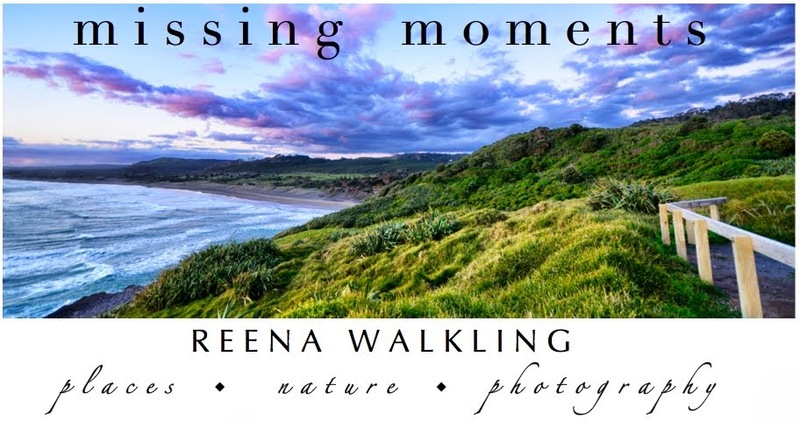 Fabulous images, Reena! Wow. And how interesting, too. I don't trust that hawk. Not one bit. Hi Reena.. What a awesome event to witness, and be able to catch on camera, with fantastic results!! Glad to see you enjoyed your summer in Maine and are now just across the big ditch from me. Sabbaticals can be great fun once everything is organised. Unfortunately I won't be going on any more as my dear old Prof. recently left me for good. amazing the life that you get to witness....nature doing its thing...not always pretty but def beautiful...smiles. Beautiful captures, the osprey's are hard to catch and blur easy for me. Amazing captures of this behavior!!! WOW!! I hope that Hawk didn't get any little ones!! Awesome action series, Reena! Have a great day and safe travels. I hope the babies are safe as well. I never liked watching the nature show where one animal =kills another. I know it happens, just do not want to witness it. I am too soft-hearted. Wow -love the drama in these shots. These are such amazing photos. 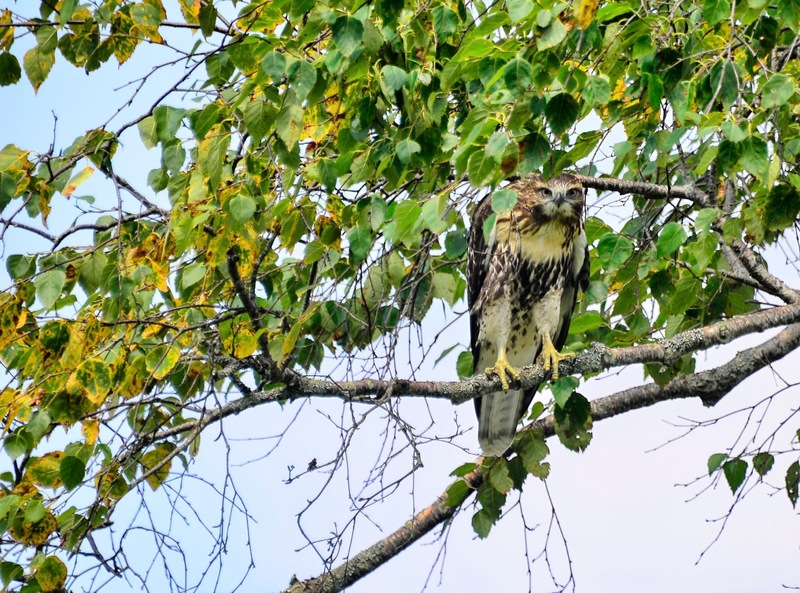 That Hawk giving you the evil eye is such a fabulous shot. Safe travels my friend. Fabulous sighting! 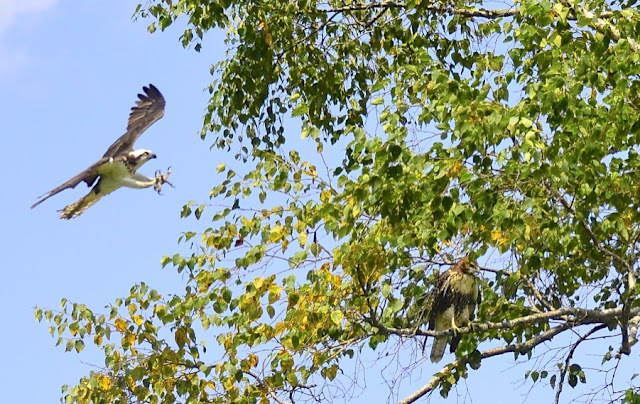 I hope the osprey young did not become dinner. What fantastic photos! What lens are you using?